We are getting very excited about the coming season and the way things are shaping up at the shop. We have a talented and knowledgable crew that we stand behind 100%, combined with a great location that never gets old. The Georgia Coast holds it's appeal to us more and more each year, as we continue to delve deeper into it's many layers and characters. 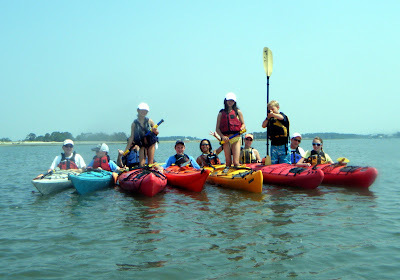 On top of some great trips and instructors, we are stoked about the diversity of the kayaks in our showroom. We are excited to be able to take anyone's idea of paddling and turn it into a reality they never dreamed of. 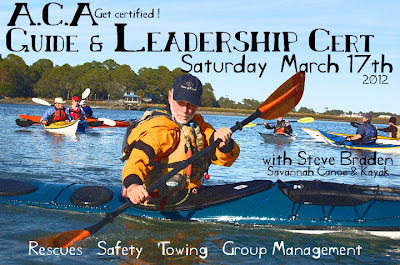 We feel we have the ability to do this because of the great diversity of people whose paths we have crossed through our 12 years and many hundreds of kayak adventures here. We have built a great relationship with many of these people, our customers, as they have come back with friends and family members time and time again...and they have become our friends as well. 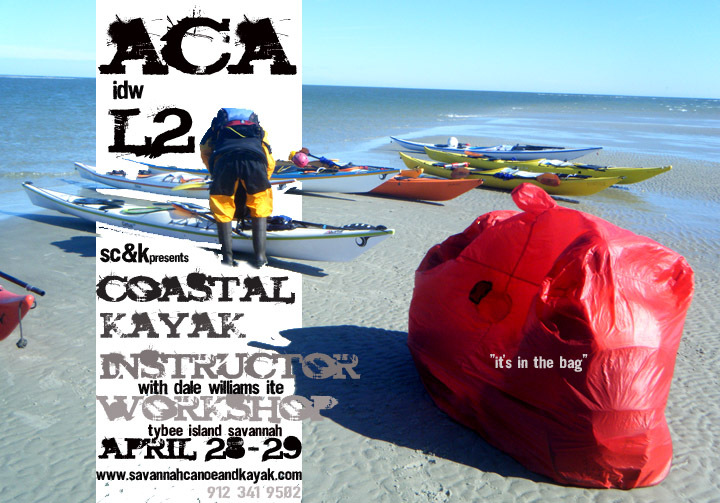 We know what is good in the kayak world, and we know what people need to get the most out of the low country. 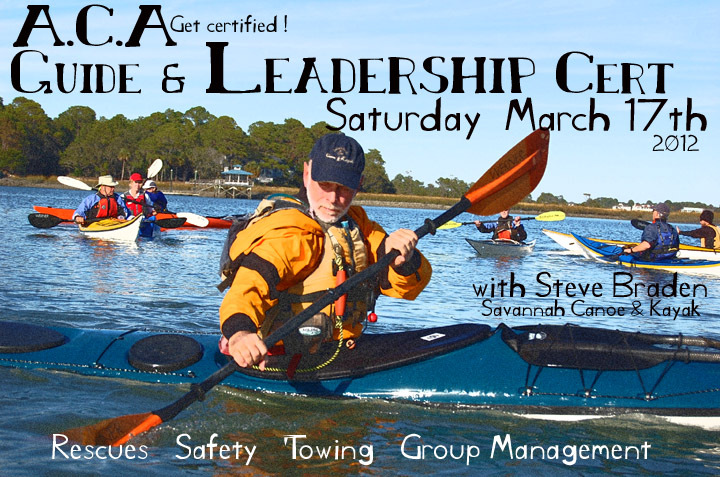 We have made it our goal to service the people first and the kayak business second. So what's new and cool in the store? Well, we now carry Liquid Logic kayaks...the comfiest kayaks on the water by far. We are particularly impressed by the Inuit series, ideal for light touring and local day tripping. With a suspended seat, the Marvel series are great river boats and ideal for afternoon cocktails in the marsh. As well as comfy seating, LL make the only sit-down stand up board, which actually makes sense to us, particularly for fishing. For a great fishing Sit On Top, the Moken from Feel Free is a great package with cool design features. 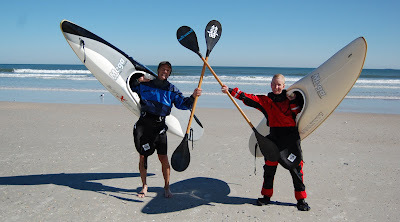 We have a sea kayak designed primarily for rolling, the traditionally styled Tahe Greenland. We pleased to carry a line of kayaks for fitness and efficiency..Stellar Kayak..lightweight composite boats at a very affordable price. We have a sea kayak designed for surfing... The P&H Delphin, the boat that is taking the west coast by storm. We will also be using Delphins in our sea kayak surfing programs. And, of course, we are known nationally for carrying the hottest surf kayaks in the world...Mega. So, as our barmy winter turns into a balmy spring please stop by the shop, and as the sign on the threshold says, there could be a change of priorities ahead. Outdoor Research Presents: The Classics from Outdoor Research on Vimeo. We love hearing from customers who have bought boats from us. We like to think that, if we have done our job right, these new boat owners' lives, free time, and mental states will be enhanced. A solo or shared experience on the water can often be the gateway to a deeper spiritual awareness, and subsequently a better understanding of one's place in the universe. Or, it can just be a heck of a lot of fun. Just before Christmas, and not long after being layed off, Phil H bought himeself a new Stellar S14. 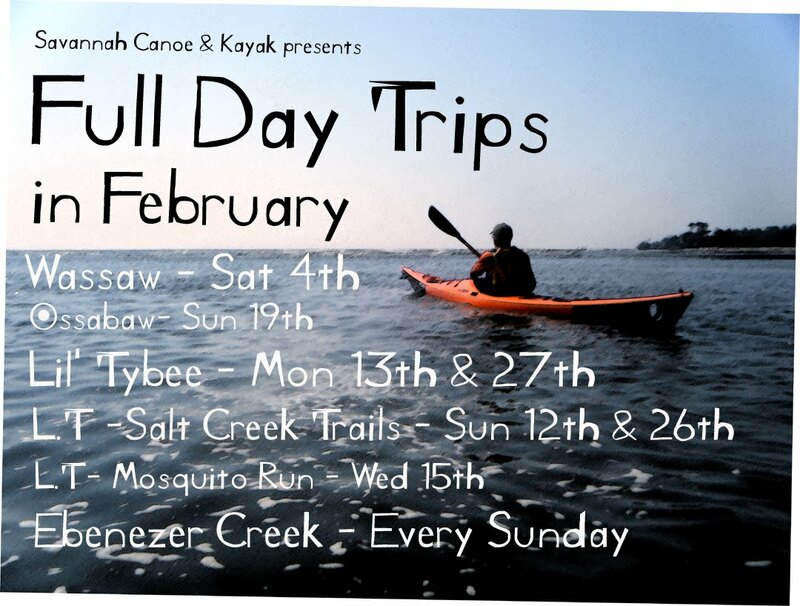 Since then, Phil has beeen on over 25 day trips around the islands, rivers, and salt creeks of Savannah. Phil is going to places where he could not go before. He has a renewed appreciation for the technique and art of paddling. He is jazzed and energized about where he is going tomorrow, next week, next year. We didn't do much, really. We bought a kayak for our shop, from a miriad of kayaks out there. We chose what we thought was a well made tool, at a resonable price, ideally suited to the right spirit. That was when Phil walked in. February- March Programs. Make a Date. Lot of good programs to make the most or our continuing mild winter season. 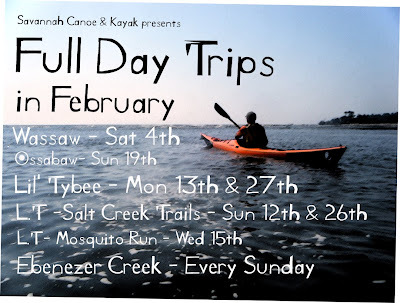 Full Day to Ossabaw Island on Feb 19th is recommended. Sunday, Feb 12th 9-1pm. 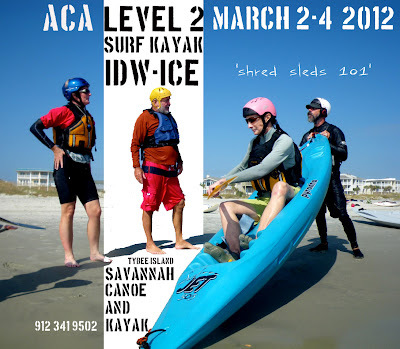 Surf Kayak L2. Thursday, Feb 16th 6-9pm. Risk Management Seminar. Friday, Feb 17th. 6-8pm Greenland Rolling Clinic. Saturday, Feb 18th. 10-2pm. Kayak Towing Prt 1. Pool Sessions every Friday from 6-8pm. And a heads up coming in April, 28-29th....L2 IDW with Dale Williams.